Schools are about reading, writing, and arithmetic, but they are also about so much more. Public schools serve an essential role in our democracy and the building of community. They serve as a place where we can forget about our differences and focus on our commonality: a love for our children. These days, as our society becomes more and more splintered, it becomes easy to lose that sense of community. We continually separate ourselves into smaller more rigid separate tribes – Democrat/Republican, Christian/Muslim, conservative/liberal, Vols Fan/Commodore Fan. We need to take the time to remind ourselves that we are all part of something much larger. We need to take time to reconnect with those who make up our children’s’ world. I hear the stories from my eldest about her and her friends and tend to lump them into tales of a 9-year-old girl, but when I am provided an opportunity to really look at them, I realize just how different they are from each other. Yet they continually forget their differences to focus on what they share: a love of being around each other. Their joy in each other’s company is palpable and contagious. It’s a feeling I need to be reminded of. Walk to School Day provides an opportunity to rekindle and share that joy. I look forward to it every year and never fail to leave with a sense of optimism about what is being created in our schools. I am grateful for the opportunity to participate every year. 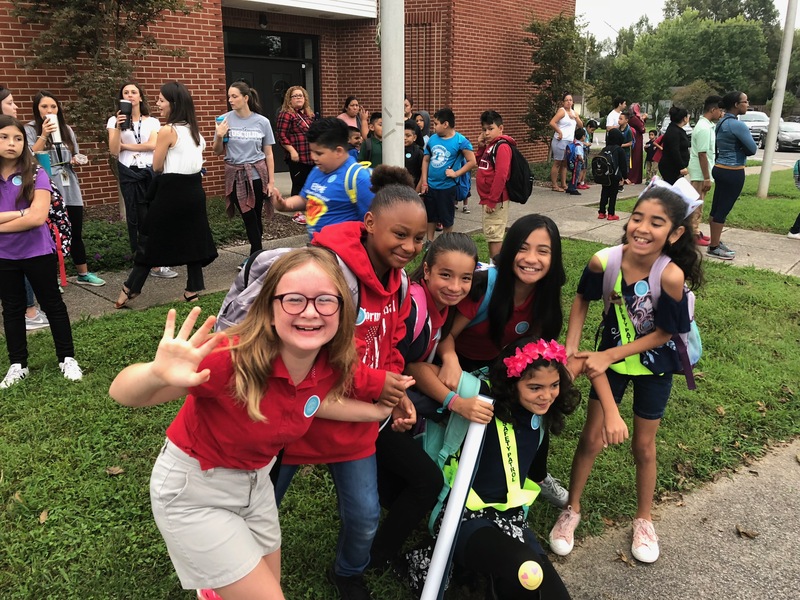 Below are pictures from both Tusculum ES and McMurray MS Walk to School Days. May they bring you as much pleasure as participation brought me. Love these schools, these teachers, these administrators, these kids, these families.